Customers can’t get enough of the next-generation aluminum Ford F-150 and high-strength-steel Ford Edge, propelling the latter to record May sales and driving up the price of the former — which remains in short supply. 2015 Edge sales were up 33.9 percent in May at nearly 14,400 SUVs compared to May 2014 as dealers received the redesigned crossover. The new Edge includes a bumper, B-pillars and roof rail tubing made out of ultra-high-strength-steels rated for 1,000 megapascals or more. 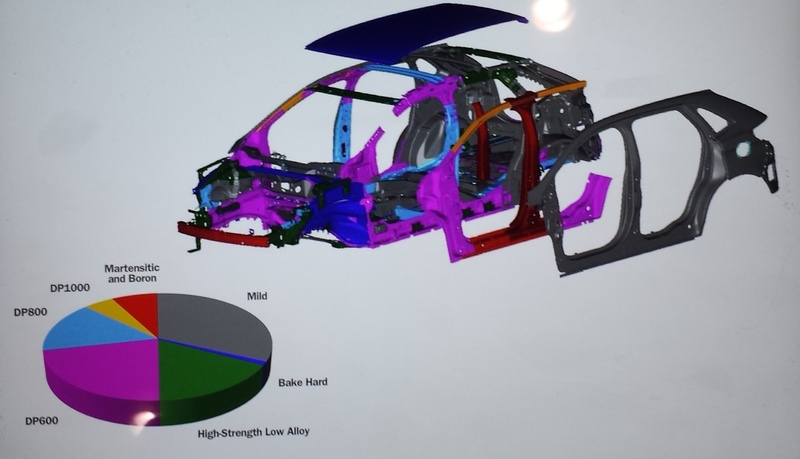 Two-thirds of the 2015 Edge body is high-strength, low-alloy steel in the 270-340 MPa range (that type of steel can reach 550 MPa) or an even stronger metal. All of these can require very different repair procedures than the bake-hardened or truly mild steel found on the car’s exterior and closures. Find out more about the Edge’s engineering and see more diagrams here. About 109,000 Edges sold last year, and it’ll be interesting to see if Ford’s momentum with the tougher SUV continues. Edge sales were up 78 percent in April, Ford said. “We say they’re selling right off the truck,” sales and marketing Vice President Mark LaNeve said on the Tuesday investor call. Ford F-Series sales were down 9.7 percent from May 2014 — but not because customers’ weren’t buying. F-150s averaged 20 days at dealerships in April, and only sat there 26 days in May. For comparison, industrywide turnaround of similar trucks was 83 days. The Claycomo, Mo., F-150 plant has only been online for part of the year, and Ford had stressed that its absence during the change-over to the aluminum truck would constrain the number of new F-150s on lots. “We knew that we were going to have our lowest availability in that period in the month of May,” LaNeve said. That’s fair, but there might be some unexpected issues happening too. 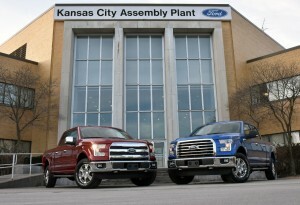 Automotive News on Friday reported that output problems with the truck’s frame supplier — which Ford wouldn’t discuss during a Tuesday conference call — had reduced shifts at the Kansas City-area plant. Ford didn’t even bother to offer F-150 incentives during the Memorial Day weekend and spent $900 overall less in incentives last month. To keep up with the demand, Ford also announced Tuesday it cut a week out of its summer shutdowns for plants making vehicles like the F-150, Edge, Escape and Explorer. Mitchell industry relations Vice President Greg Horn also offered some auto body repair insight into the F-150 with another webcast Tuesday. About 1,500 auto body shops are certified to fix the aluminum F-150, according to Horn. Ford said Wednesday that 757 dealerships and 750 independent were trained to do major structural repairs on the aluminum F-150. Other shops of course had been doing cosmetic work on aluminum panels since 1997, the company noted. 2015 Ford F-150 collision parts were still virtually identical in cost to their 2014 steel counterparts, Horn said in the webinar. He said he couldn’t estimate the average cost of repair compared to the 2014 F-150. “It’s just too early in the life of the aluminum F-150,” Horn said. Correction: Mitchell industry relations Vice President Greg Horn on Tuesday afternoon corrected his count of the number of auto body shops and dealerships certified to fix the aluminum F-150 from 7,500 to 1,500. We’ve altered the story to reflect the change. Correction: Ford corrected an earlier statement and information about the number of plants which will have a reduced “Summer Shutdown,” and we’ve revised the article accordingly.